April 4th, 2017: How does Turbo Scrub 'scrub up'? Nov 27th, 2016: Turbo Scrub vs. the competition. Turbo Scrub takes the gold in this head-to-head! Nov 17th, 2016: Hands-on test with Turbo Scrub. Check out the amazing results! The Cordless, Handheld Power Scrubber! 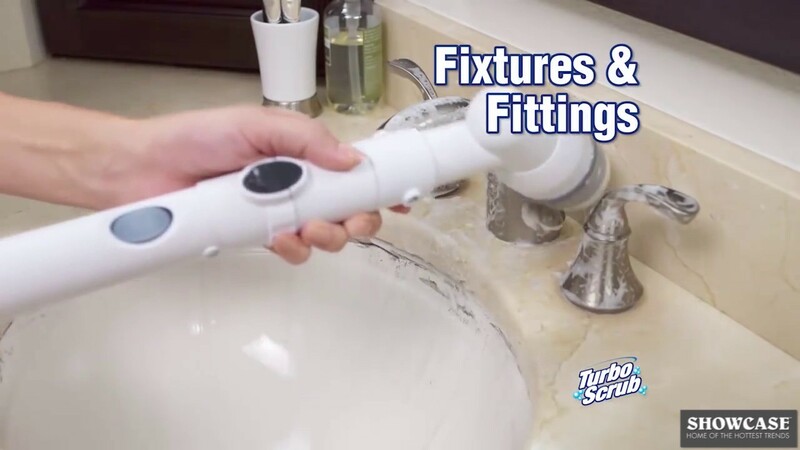 Introducing Turbo Scrub, the cordless, rechargeable hand held power scrubber that will take the work out of cleaning! Its powerful head rotates at over 300 revolutions per minute so you can scrub and clean with minimal effort. The lightweight, maneuverable design allows you to clean in those hard to reach places. Best of all its cordless and rechargeable! With three interchangeable brush heads you always have the right tool for the job. The all purpose brush is perfect for powerful scrubbing anywhere, the corner brush head is ideal for corners and all those tight, tough to reach areas while the heavy duty brush is perfect for tackling the toughest stains on tile, grout & more! The included extension pole also helps you clean all those extra high or low places. It works well , but could use more power. It seems to do the job. I’m glad I bought it. The turbo scrub is great. The delivery time was great as well. Job well done. THANK YOU. Very easy to use and does a great job - I love it ! !